Sometimes it's the little things that bug players. And sometimes those little things are worth fixing. That's the case with Battlefront II, a game with a playerbase that's been frustrated by microtransactions and a lack of new content but at least has had their call answered to get rid of the holograms in the game's menus. The holograms showed up in the game's menus, of which there are a lot. For a game about blasting folks and slicing them with lightsabers, Battlefront II has a lot of menus to navigate if you want to customise your loadout or tweak character appearances. For the longest time, player character models were presented as if they were being seen through the movies' iconic hologram projectors. While suitably moody, it made menus hard to read and more subtle character skins difficult to tell apart. The game's latest update changes the menus by ditching the holograms and showing characters in all of their highly rendered, most certainly expensive glory. The original menu style was unique but didn't really show off your character. The change comes alongside numerous quality of life features including better load times and the ability to play the game's Starfighter Assault mode in the offline arcade. These changes might help the game's image following a controversial, loot box packed launch. 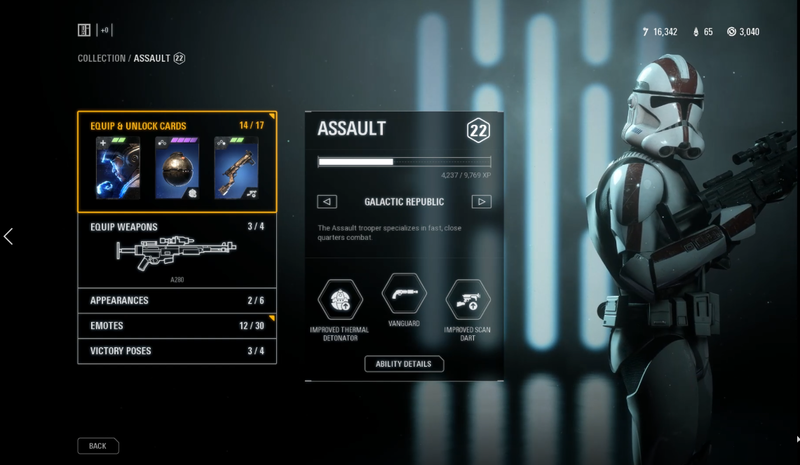 Community desire for a clean menu screen was so high that one of the most popular mods for the PC version removed the hologram effect months before EA did. Reactions on fan forums such as Reddit are very positive, noting the change as one of the better features of a patch light on new content. "I pissed myself when I saw Vader walking in the first time," one Redditor said in a thread about the changes. Characters selected in the menus enter the screen with a dramatic, deliberate march before striking a pose. "Baby steps," another said. "Dice is making good progress and if they keep up the quality updates than I believe the [Clone Wars] content will save the game." The implementation isn't perfect. For now, these changes only apply to the "Collection" menu that players use to customise their class loadouts and not to the menus during a match, such as the scoreboard that shows at the end. These changes will be applied to everything else in the near future. Battlefront II still has a long trench run to truly win back the crowd but these changes are a reminder that little tweaks can often make a big difference. No mention of the leak that basically confirms that the game has been abandoned by EA? The leak which predicted point-by-point all the new content before it was announced, as a way of proving their legitimacy, then went on to claim that there's only a skeleton crew of DICE devs left to fulfil contractual obligations with Disney and that the game is effectively dead to EA, with zero fucks given? Yeah, interesting how that hasn't had its own Kotaku article, nor has it been mentioned in the last couple 'Solo season' reaction articles. I thought 'proved leak' articles were a thing, here.